We're hearing rumours that David Richards is on the verge of being announced as the new boss at Renault. The Prodrive boss, who missed out on entering F1 with his own team in this year's selection process, is understood to have attended a meeting at Enstone this afternoon, just hours after the French team announced that Flavio Briatore had been fired. 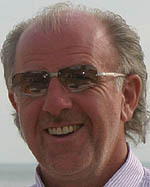 Richards, who spent a couple of seasons as team boss at BAR, leaving when Honda bought the Brackley team, had previously enjoyed success with Benetton, which was to become Renault in 2000. We must stress, there is absolutely no official confirmation of this story, but it does come from a good source.